Last night, Grammie was available to take the kids and The Hubster and I had a chance to relax at a deliciously unique and casual hang out in Huntington Beach called SeaLegs Wine Bar. 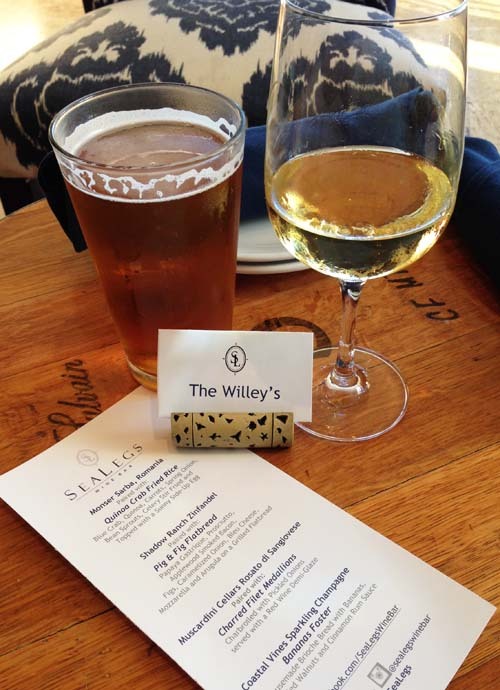 SeaLegs Wine Bar is the creation of Alicia Whitney, originally an event coordinator in Las Vegas, who journaled detailed notes of a pairing/dining concept, with the help of a few partners and Chef Alexander Dale (whose family owns Newport Beach’s Villa Nova), is now a reality. Once she was married and became a mom, Alicia had some amazing ideas on the type of restaurant space she wanted to open and the atmosphere she wanted to create. 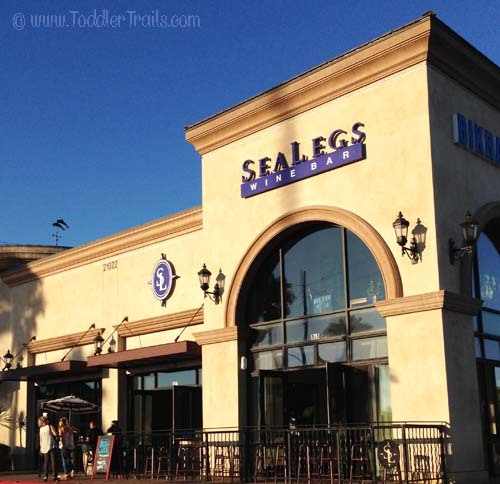 When we walked into SeaLegs Wine Bar in Huntington Beach, we instantly felt at home. To the left, wine cellar wall makes a beautiful rich back drop behind the bar. The open table spacing is perfect for an intimate date night or couples night. Off to the right of the dining room, a space designed for casual mingling for parties, events and cozy get togethers was the perfect place for us to relax, sample different wine offerings and delicious entrees. An event at SeaLegs Wine Bar is just classy. We certainly enjoyed the personalized touches and the samplings that were pre arranged. The first course, a white wine – Monser Sarba from Romania paired with Quinoa Crab Fried Rice. The Quinoa Crab Fried Rice was my absolute favorite. 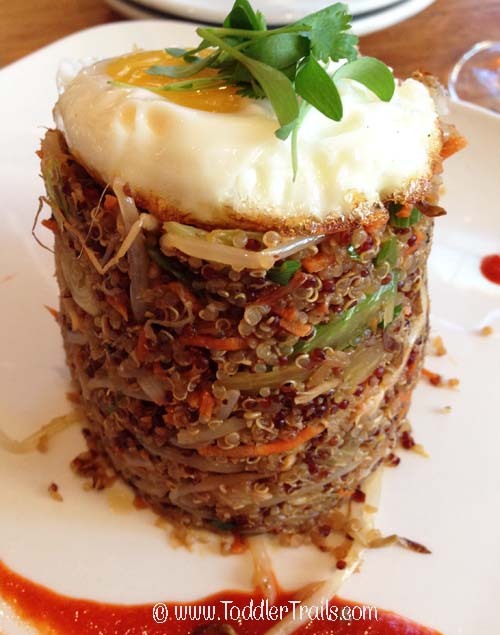 The presentation was amazing with the sunny side up egg placed on top of this beautiful tower of quinoa, carrots, blue crab, spring onions with a sriracha sauce accent that gave it a little fire. The Hubster did the honors, cutting into the top of the tower, releasing the yoke and slowly mixing the ingredients into the perfect mixture. The second course was my husband’s favorite. He had a hand crafted draft beer paired with the Pig and Fig Flat Bread. 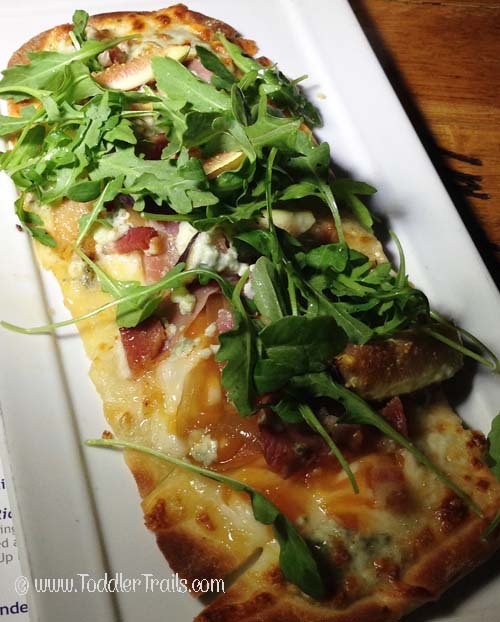 Anyone who loves blue cheese, prosciutto, applewood smoked bacon, figs, caramelized onions, mozzarella and arugula, this dish is for you. 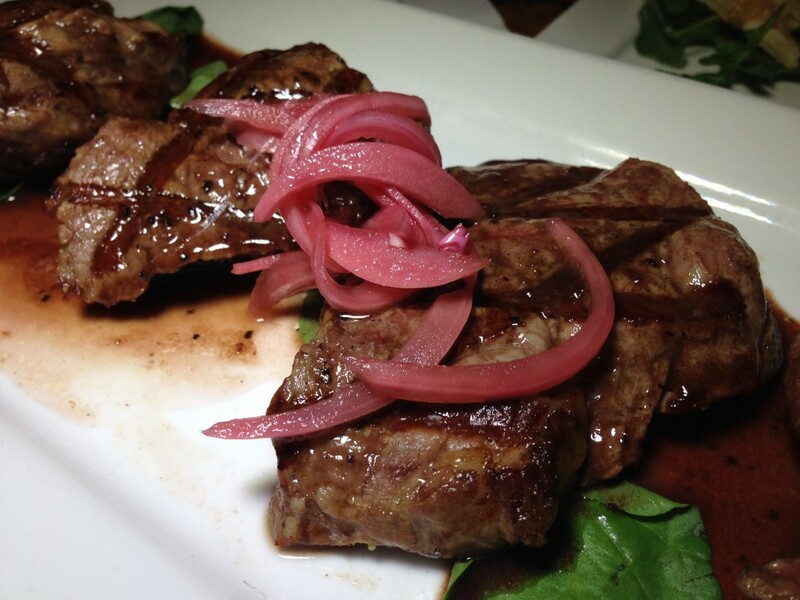 The Charred Filet Medallions were perfectly seared in a red wine demi-glaze. We savored each tender bite – fighting over the last one. The Filet Medallions were paired with a Muscardini Cellars Rosato di Sangiovese, my favorite wine of the evening. To top off the evening, we were presented with this beautiful Bananas Fosters paired with a Coastal Vines Sparkling Champagne. Not being a fan of bananas, my husband truly enjoyed the entire dessert. 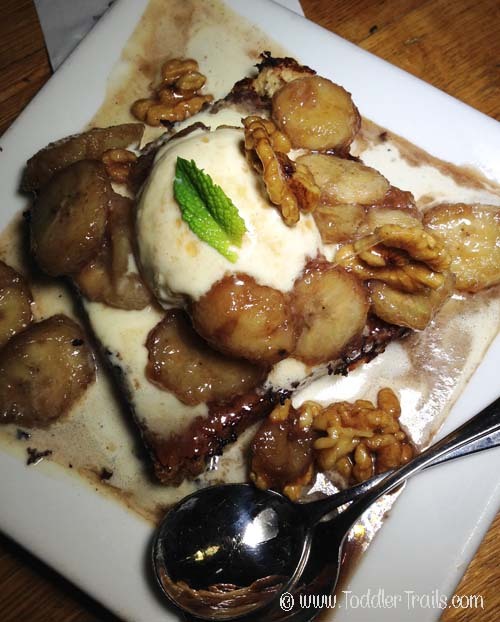 This Bananas Fosters was presented on a homemade brioche bread with candied walnuts and cinnamon rum sauce, which to me sounds amazing (minus the bananas). If you are looking for a great location for a bridal shower, reunion, get together or simply a night out with out the kids, SeaLegs Wine Bar is an excellent choice. Stop in and tell Alicia that Mike & Jenn sent you! Giveaway ends July 27, 2014 at 9:59 PM PST. Open to US Residents 18 and older only. Prizes cannot be shipped to PO Boxes. Winner will be selected at random and be notified by email. Winners have 48 hours to respond before a new winner is selected. Not liable for unclaimed prizes or fulfillment. Blog has represented each sponsor with the expectation they will fulfill their prize and in a timely manner. No purchase necessary to enter or win; however you must enter for a chance to win. Purchase does not increase chance of winning. Chances of winning depend on number of entries. My opinions are my own and were not influenced by any form of compensation. Facebook, Twitter or any other social media platform are in no way associated with this giveaway. By providing your information in this form, you are providing your information to this blog. I do not share or sell information and will use any information only for the purpose of contacting the winner. Winners can only win once per month. Not liable for unclaimed prizes or fulfillment. 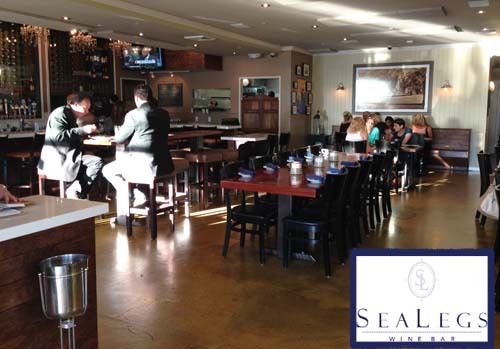 Disclaimer: We were invited to attend a media event at SeaLegs Wine Bar to sample their menu and share our experience. No compensation was received. We really don’t go out that much at all but my folks live in HB and this place sounds like a fabulous date night. Thanks for the giveaway, Jennifer! I love SeaLegs!! My friend lives right up the street, so for a girl’s evening out, we go there. Love it! I do not live in Huntington Beach. The Beachcomber! We go out date night maybe once a year if even that. If we do go its to maybe a close friend wedding or something only! We go on date night a couple of times a month to various restaurants or movies. We go out every Friday night but usually have 1-2 of our 4 kids with us. Date night alone maybe once or twice a year. This place sounds really great! We have a date night every few months and we usually go to dinner. Whoa, that place looks awesome! I’ve seen people post about it on Instagram but the food looks amazing! I’m not usually up in HB but I may have to head up just to check this place out! Those pictures make me hungry! We usually only get date night 1-2 times a year alone, hopefully we’ll get to do more soon even though we have baby #2 on the way. We usually go to the Spectrum and eat at Cucina Enoteca or we’ll have a lunch date and go to the movies after.